A visit to Coney Island and the Luna Park amusement park is a little like stepping back into history. 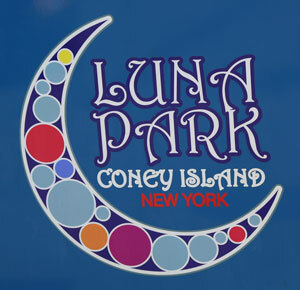 The current Luna Park is the modern version of the historic Coney Island park. They also operate the historic Cyclone roller coaster. 2017 Unlimited rides wristbands available for $24. Regular full-price is $35. This Goldstar offer is good for any regular operational day at Luna Park through October 29, 2017. Free Wristband with New York Pass: A free 4-hour unlimited ride wristband is included with The New York Pass . Luna Park Facebook Page – you’ll sometimes find discount offers listed on Luna Park’s Facebook page. Sign up for the NYCCheapTravel newsletter for updates on this and other NYC discounts and deals. Coney Island is in Brooklyn and is accessible by subway. How to get to Coney Island by Subway. See the Luna Park website. New at Coney Island! – The Ford Amphitheater at Coney Island Boardwalk opened in 2016 and has a full line-up of concerts scheduled through September.